Info "On the menu this evening: a giant slab of meat! Spin it to make sure it gets cooked evenly." BYOM is one of Kat and Ana’s Microgames in WarioWare: Smooth Moves. Normally, the abbreviation "BYOM" means "Bring your own music". In this case, it may mean "Bring your own meat". A giant piece of meat will be roasting on an open spit. The player must rotate the Wii Remote to cook it evenly. Taking too long will have the meat burn, ending the game in a loss. 1st level difficulty: The meat is thin and easy to cook. 2nd level difficulty: The meat is thick and a bit harder to cook. 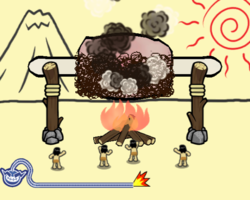 3rd level difficulty: The player must roll a giant piece of meat toward the village. Like All Wound Up, when played in the Temple of Form, this microgame will reveal a bonus after the third stage: the microgame Bungii!. Bungii! can be selected normally in the Remote Control group. This page was last edited on January 25, 2019, at 19:32.